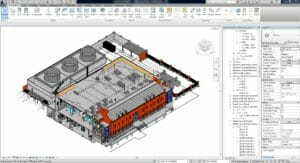 Insights > The Benefits of BIM: This state-of-the-art project modeling accelerates construction schedules while reducing costly errors. The Benefits of BIM: This state-of-the-art project modeling accelerates construction schedules while reducing costly errors. “BIM is a very broad term for an intelligent computer model of a building that shows different levels of design and is integrated between all disciplines,” explained Gary James, FSB’s President and CEO. What that means is that BIM modeling takes designs from traditional 3D to 4D and serves as a platform for project teams and other non-technical stakeholders, who then can more accurately visualize the assembling of a building over time. This ability creates significant benefits for the project, especially when it comes to moving the design and construction phases along swiftly, with better communication between the A/E, Owner and Contractor. As noted above, the most significant benefits of BIM are its ability to enhance project planning, reduce errors and speed up the construction process. Over the lifetime of the project, each piece of vital information can be attached to the model, where it’s immediately and easily accessible to everyone involved. FSB routinely shares its BIM models with contractors and subcontractors, a practice which is highly effective in keeping projects on track, especially if they’re on an aggressive schedule, which is increasingly the case, he said. “It can save as much as 20% or more of the design and construction timeline for a project, depending upon the complexity of the job,” James added. 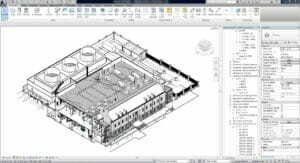 Utilizing the Revit software also allows FSB’s architects and engineers to interact with a manufacturer’s website, importing specific information for building components. This information can include exact dimensions, 3-D models and other equipment-specific information that comes directly from the manufacturer. Since FSB does not have to draw these items, time is saved, and accuracy is improved. This specific information is then attached to the BIM model, so contractors know exactly which equipment they need to order. This feature alone is huge in that it eliminates many potential errors during the construction process, which translates into fewer construction delays and better cost estimating and cost containment, said FSB Mechanical Engineer Rebel Smith. BIM’s usefulness doesn’t end once a building is completed. Clients can use it as a tool to track and plan for needed maintenance throughout the life of the building. It also serves as a huge time-saver for FSB and its many repeats, should they need an expansion or renovation to their facility down the road. 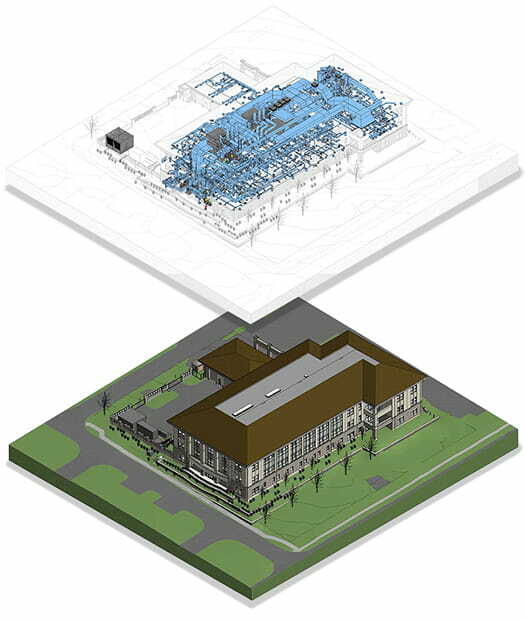 To learn more about how BIM modeling services can benefit your company, contact Gary James, President, CEO and principal for FSB’s Civic Market, at fsbceo@fsb-ae.com or 405-840-2931.